Yet another review of the American edition of Reed's A Map of Verona and Other Poems turned up in Google Book Search recently, this one by the poet, editor, and translator Babette Deutsch. In addition to Tomorrow, Mrs. Garrett also established the Parapsychology Foundation of New York in 1951, publishing the International Journal of Parapsychology. 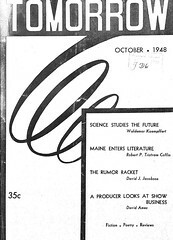 This issue of Tomorrow sports critiques of Graham Greene and Aldous Huxley, but also includes a review of Dr. Jan Ehrenwald's Telepathy and Medical Psychology (New York, 1948). As woo-woo as this all sounds, the contributors and writing seem top-notch. Babette Deutsch was born in New York City in 1895, and was the author of ten books of poems, four novels, and several books of criticism, as well as a respected translation of Eugene Onegin. She lectured at the New School for Social Research and Columbia University, which awarded her an honorary doctorate in 1946. She was married to the translator Avrahm Yarmolinsky, who was the head of the Slavonic Division of the New York Public Library. The Lessons of the War she describes as 'arresting,' and possessing a 'restrained power'; some of his other pieces exhibit a 'melancholy loveliness.' But on the whole, she finds Reed's volume lacking. His verse is 'cloying' in its melodiousness; 'curiously middle-aged' and Georgian; 'soporific' and colorless. Deutsch compares him unfavorably with Aiken, Ransom, and finally Wilbur. All this in one paragraph of 220 words. To give credit where credit is due: I never would have found Deutsch's review if two-thirds of it weren't devoted to singing the praises of Richard Wilbur. It had been dutifully and lovingly cataloged by Wilbur's biographers and bibliographers.